It’s also nice to get the user’s port auto-enrolled to specific user VLAN what they authenticate. 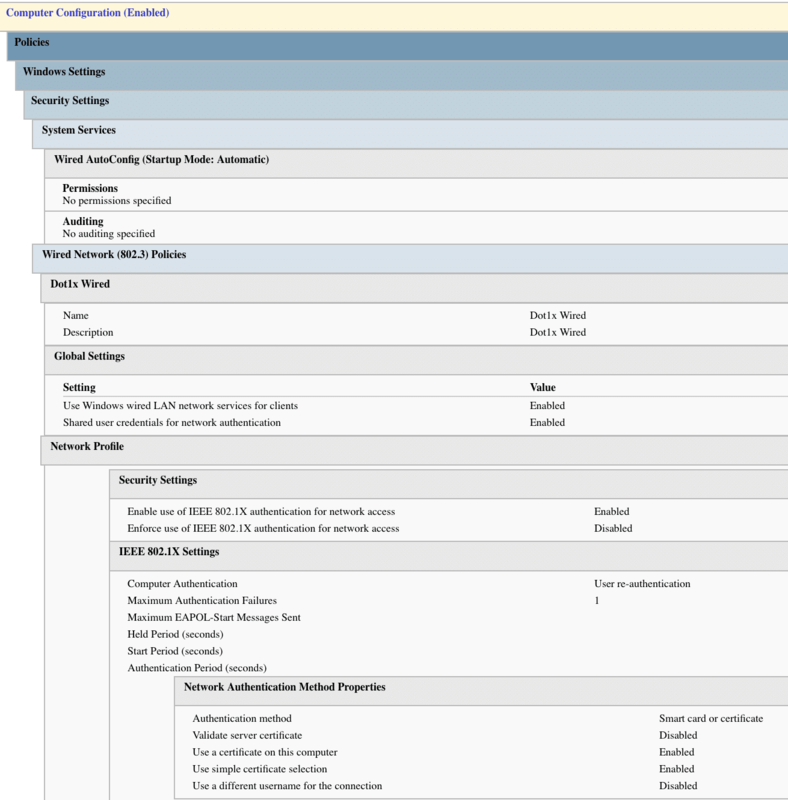 VLAN auto-configuration enables us to give to specific user their own VLAN configuration no matter where they are connected. Remember, today, most users have notebooks not desktop PCs and in the office environment they are probably separated in different VLANs for different departments. You do not want that users going from one office to another colleagues office to connect to the wall and get into different VLANs all the time. With VLAN auto-configuration wherever the users connects inside the building it will be connected to his own VLAN based on his Active Directory group membership. This is really cool. It is also pretty simple to explain how it works. 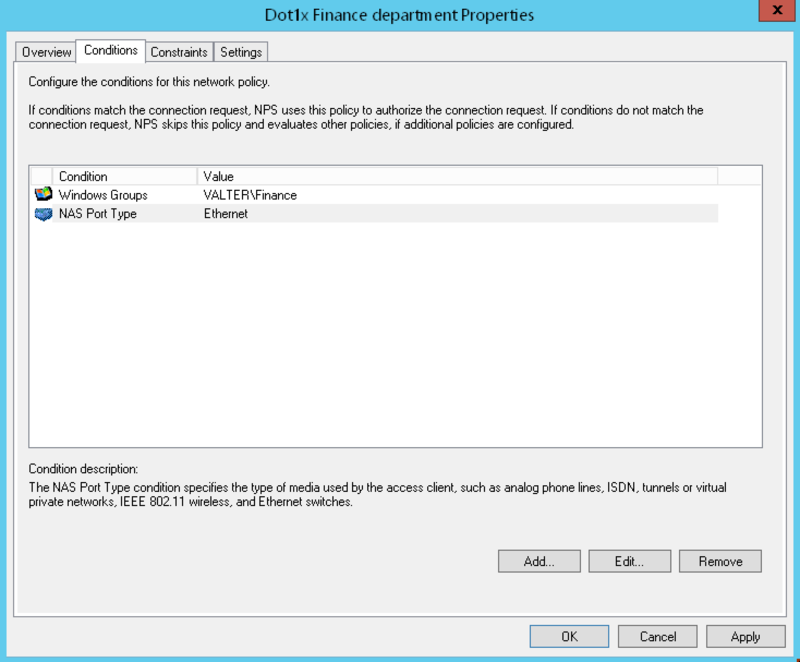 You create different NPS Network access policy for every VLAN and then add Windows Group condition for different policy. 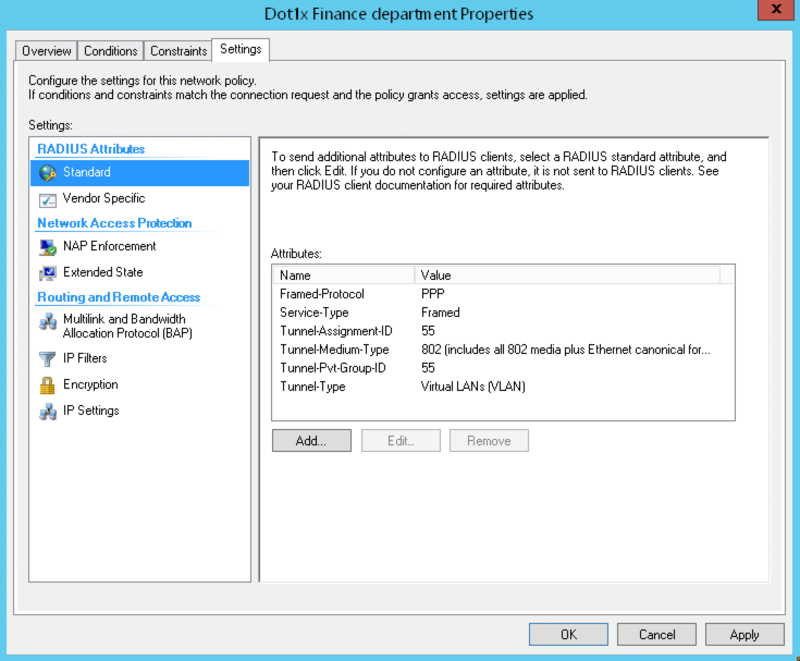 On every policy you specify VLAN ID for that group/department and configure the switch like below. Every matched policy on our Radius server will then send VLAN ID as an attribute to the switch and the switch will configure the port accordingly. Of course you need to have that VLAN created on that switch, don’t be silly. In our example below, unauthenticated users will be configured inside VLAN 99 which is our imaginary Internet only VLAn with no access to internal network environment. I’ll give you line by line explanation of those commands entered just in case. mac-move is permitted so that users notebook disconnected from one port where he was authenticated can be connected to some other switch port and be authenticated automatically. 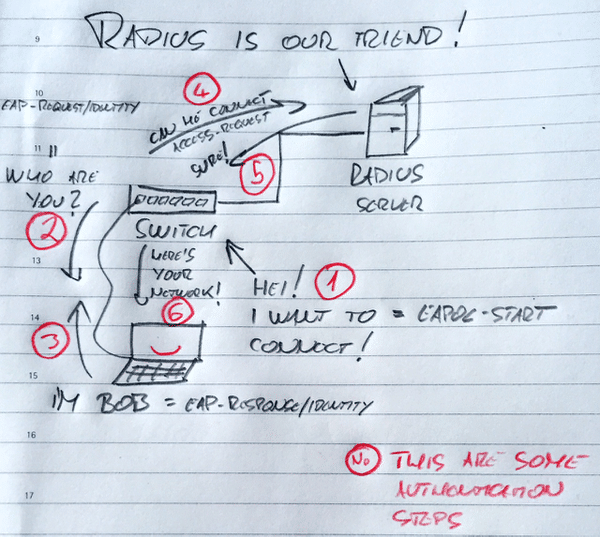 Radius server IP address and UDP ports. You can skip ports, those are default ports. Use it only if you would like to use non standard ports. You don’t want to do that really. If authentications does not happen or breaks somehow, like when client is not dot1x capable, put that device to VLAN 99 too. This is mostly default by enter it to be sure, it allows EAPOL traffic to pass through the port even if the port is in unauthenticated state. Basically allowing future possible authentication request to be received from clients. If disabled “no dot1x pae authenticator” port will be dot1x enabled but it will block authentication requests so it will not really work. Timeout tx-period for dot1x speeds up Guests entering VLAN 99. Cisco Catalyst switches by default have values of tx-period set to 30 seconds and max-reauth-req set to 2 times. With this default settings your Guests in meeting room when connected to wall ethernet jack will need to wait for 90 seconds to get Internet access. In our config it will take about 10 to 15 seconds. We put inside the condition to match only when user from Finance department tries to authenticate. And the condition to match only if it’s an dot1x request. We added Smart Card or other certificate authentication method. It will enable EAP-TLS authentication with user or computer certificates. I didn’t remove less secure authentication methods here but you can if you wish. Those less secure authentication methods will probably get your users the prompt for domain username and password if something goes wrong with certificate authentication. The best part. We set the Radius NPS policy to send attribute 55 to the switch if someone from Finance department tries to authenticate. Switch will use that to configure this user port in VLAN 55. Of course, you will repeat this four steps and create additional NPS policies for all your users VLANs/Windows Groups. Only thing you need then is to have machines that are members of your domain and a certificate authority installed on your AD server for certificates auto-enrollment of this machines. Ok, they probably already have at least computer certificate so we can say you are good to go here. Group policy will auto-configure all Windows machines members of our domain and users will not even know that something happened. We will change the default Wired AutoConfig service setting and make that service start at startup every time. We will configure dot1x on client machines to use user or computer certificates to authenticate. Please do not forget to set the scope of the GPO so that the GPO object is linked to and OU which contains all your users machines. This GPO is a Computer GPO, that’s why! Also, in the scope tab, set the security filtering to “Everyone” or to the group containing all User Computers like “Domain Computers”. Also, do not be afraid, if the computer is configured for dot1x with this GPO it will work on non-dot1x port too. When connected to non-dot1x port, it will send EAPOL-Start message but if switch don’t answer with Identity request computer will simple get the connection and stop trying to authenticate. In your setup is that all your machines will go to VLAN 99 in the first instance ( until Windows Logon) and then, once they login, each user will be on their own VLAN ( e.g. VLAN 55 – Finance) ? Need to understand a bit better this VLAN allocation per AD Group.